✔️HIGH STRENGTH. 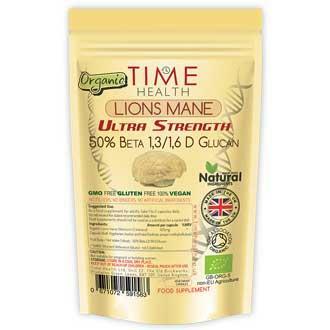 Time Health Ultra Strength Lions mane (Hericium erinaceus‎) is a High Strength Extract containing 50% Beta 1,3/1,6 D Glucan. ✔️NATURAL & VEGAN FRIENDLY. Time Health Ultra Strength Lions Mane extract is grown traditionally and naturally (not grown in a lab on substrates) on large hardwood sticks. Our Lions mane is 100% vegan friendly. ✔️ORGANIC PRODUCT, MADE IN THE UK. Soil Association certified organic, grown without chemicals or pesticides. Manufactured in the UK to GMP standard with only the finest quality raw materials. ✔️NO FILLERS, BINDERS OR ADDITIVES. At Time Health, we believe in clean nutrition which is why you won’t find any nasty stuff in our products unlike some of our competitors. [FYI] We also have Organic Lion’s Mane 37% Polysaccharides for those who prefer a slightly weaker dose. 425mg Lions mane (Hericium Erinaceus‎) 50% Beta Glucans. [FYI] We also offer Organic Lion’s Mane 37% Polysaccharides for those who want a slightly weaker supplement. As a food supplement for adults, take 1 to 2 capsules spread out during the day, or as directed by a healthcare practitioner. Do not exceed the stated recommended daily dose.